Bin Hindi Motors, exclusive distributors of KIA MOTORS vehicles and genuine spare parts have been conferred with “Business Excellence Award” by MOBIS for the year 2016 at the Middle East and Africa Parts Conference which was held in St. Petersburg, Russia. The award was received by Mr. Ullas Yohannan, Parts Manager, from Mr. Hoon Lee - Managing Director- Mobis Parts Middle East (MPME). In his key note Mr. Lee had specific commendation on KIA Bahrain’s Genuine Parts sales, sufficient stock and its strategic Genuine parts sales channels which has managed to uplift the confidence of thousands of happy KIA customers. On a special note Mr. Lee also expressed his greatest satisfaction on number of line items the Bahrain distributor has in stock which included the complete range of mechanical as well as body parts. 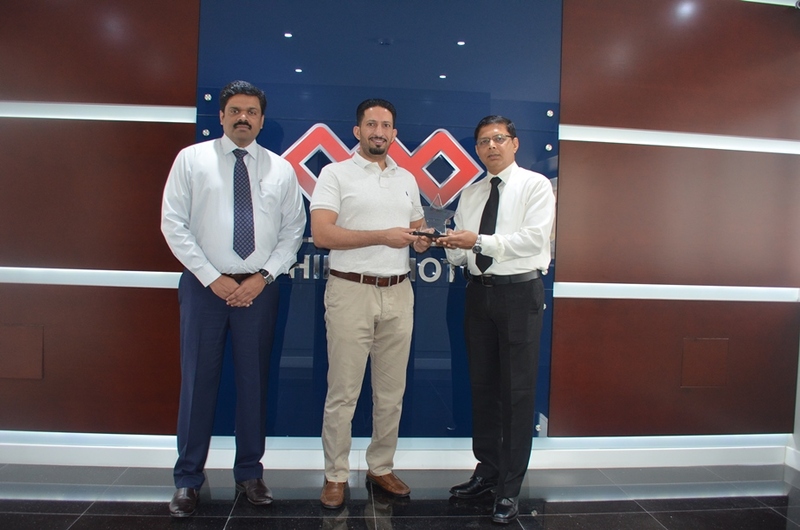 “The award clearly depicts that more and more customers are opting for Genuine Parts rather than counterfeit parts as it is durable and value for money which in turn ensures the customer a safer and smoother drive especially on extreme weather conditions” – Says Mr. Ullas Yohanan, Parts Manager, KIA MOTORS Bahrain. “Our competitive prices which are set for the KIA Genuine parts gives the counterfeit parts business no room to thrive” he added. Thanks to all our valued KIA customers for opting Bin Hindi Motors as the first preference for all your after-sales needs. To improve the accessibility of KIA genuine parts, Bin Hindi Parts strategy for the coming year would witness several micro Genuine Parts dealerships across Bahrain which will be located in strategic locations, says Mr. Rama Subbiah, General Manager - KIA After-Sales Centre. “We are also proud to say that we have invested heavily in parts storage systems and follow a modern inventory system making parts availability a top priority for our customers, which is one of the key reasons that KIA has become a brand that people would like to consider when deciding to buy a car…competitive & Cheerful yet durable. We at Bin Hindi group are committed to provide genuine service and family like care to all our esteemed customers” Mr. Rama Subbiah added. On a very special note Mr. Ahmed Bin Hindi (Vice Chairman & CEO) and Mr. Nawaf Bin Hindi ( Director & Deputy CEO) of the A.A. Bin Hindi group congratulated the members of the after-sales team and wished them many more such accolades in the future.